I will be posting more links to more interesting projects as comments to this post, like I did in my Cool uses for the Raspberry Pi posting. Some of the most interesting that spend some more time at can get their entire own postings this blog in Arduino section. BADLAND BRAWLER – Amazing Off Road Robot with 4 Wheel Drive. Start building your own Off Road Robot. Although 3rd party applications and plugins are available for port logging, it is possible to log data directly into Microsoft Excel through Visual Basic. There are no lack of applications tailored towards saving a .CSV file from an open port, which can then be imported into Microsoft Excel. For instance, GoBetwino, Processing, and Eltima Port Logger are useful and implementable strategies. However, it is possible to have Visual Basic (underneath Excel) listen to the serial port and output the data directly into Excel without requiring another program or plugin to load – in both Mac and PC versions. Visual Basic connects directly to the COM port. Setting a faster baud rate in the PC macro works well. For the Mac version of Excel, things are a little more complicated. I was unsuccessful in using a baud rate other than 9600bps with the Mac macro, even with the stty command in the terminal window. Industrino has unveiled their new universal 4–20mA sensor transmitter that allows you to take an Arduino-compatible 3.3V sensor and transform it into a long-range industrial counterpart. When [Leon van den Beukel] found a toy glockenspiel in a thrift store, he knew what had to be done – Arduinofy it. His first attempt was a single hammer on a pair of gimballed servos, which worked except for the poor sound quality coming from the well-loved toy. The improved instrument was then outfitted with eight servos, one for each note, each with a 3D-printed arm and wooden mallet. This instructable’s aim is to teach people how to create a watering system from scratch. This is done by controlling the various factors that affect a plant’s growth through the use of a sensor and a smart mini-controller – such as Arduino Uno. By the end of this paper, you will be able to create a fully functional watering system for your plant. GreatScott! shares how made a 6×6 pad, using a 3D-printed body and buttons arranged in a matrix to save I/O, along with WS2812B LEDs. Probably the most useful Arduino project I’ve ever made! A automatic tester for a product I sell. The making of a large 3D printer (400x400x400 mm) for a college project. Don’t Delay() Use an Arduino Task Scheduler Today! As my Arduino projects became more complex I started to realize the delay() function caused unforeseen problems. While in a delay, the Arduino/AVR can’t process any other code (with a few exceptions). I came across this solution while researching another topic and I thought I would document it for my future projects. Alan Burlison created an eloquent Task Scheduler library that solves the delay issues —but more importantly, it made me rethink how I design my Arduino/AVR projects. This program solves the ESP module with only simple commands. 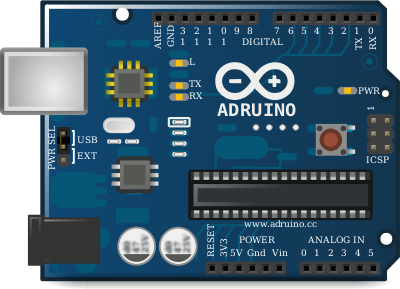 Connect the Arduino digital port 7 with the ESP GPIO0 pin, which is labeled D3!!! Connect the Arduino digital port 8 with the ESP GPIO2 pin, which is labeled D4!!! If you are not using nodeMCU but ESP-01, you will need a Bi-Directional Logic Level Converter. The German Enigma device has always been a fascinating gadget for hackers. We’ve seen various replicas and emulators created over the years, and it was recently even the subject of our weekly Hack Chat.